The subtlety of the music by this quartet is obviously the result of the close listening and the sensitive interaction of its members, whose playing blends superbly in this recording. 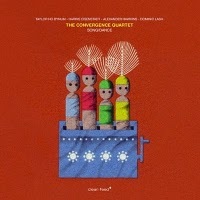 The finely wrought textures of layered sound and silence are excellently captured and the acoustic nuances of the instruments come though sublimely, from Taylor Ho Bynum’s softly articulated cornet and flugelhorn, Harris Eisenstadt’s ecstatic drumming, Dominic Lash’s throbbing bass and Alexander Hawkins’ eloquent piano explorations. Some prominent examples of these dynamics arise in the staccato theme of “Second,” the flowing melodic unfolding of “Next Convergence,” or the spacious atmospherics and unhurried development of “Baobas.” In the latter, Bynum’s velvety sound and the creative devices of each of the musicians come to play in a piece that is out of time, but rhythmically interesting, nonetheless — one of the challenges of this kind of music which grafts compositional form with in-the-moment acoustical abstraction. Bynum’s tone is equally exquisite in “Iris,” wherein he explores the trumpet’s sonic possibilities in extended techniques reminiscent of players like Bill Dixon and Natsuki Tamura. These musicians have all had extensive experience as sidemen in the projects of veteran players on the creative music scene, like Anthony Braxton, Leo Smith and Cecil Taylor. What they bring to the table is eclecticism that borrows from idiomatic traditions like jazz and classical while taking a step beyond these to create their own sound and concept. This is amply evident in the tribute piece called “Albert Ayler,” which evokes the peaceful garden and hymn-like qualities of Ayler’s music, without mimicking the mannerisms. The album’s title piece calls itself a “blues,” but although it starts with a muted cornet/drum duet reminiscent of Joe Oliver, it is only a blues in the most general sense of visceral expressiveness. It quickly shifts to a more modal sound, an elastic approach to harmony, and takes many liberties of form and textures that people like Miles Davis, Bill Evans and Wayne Shorter never probably even dreamed of, although I suspect someone as forward-looking and open-minded as Gil Evans would thoroughly approve. Something resembling Kind of Blue also comes up in “The Pitts,” as it does in the quiet impressionist in “Representations 17,” with masterful use of space and harmonies, especially from Hawkins’ piano. The joyful gospel/calypso “Kudala (Long Ago)” is the most traditional in melodic, harmonic, formal and rhythmic intention and kind of sticks out as a little cloying in comparison to the other more robust and creative pieces. But that is balanced by the rest of the disc, which offers many profound moments of listening.